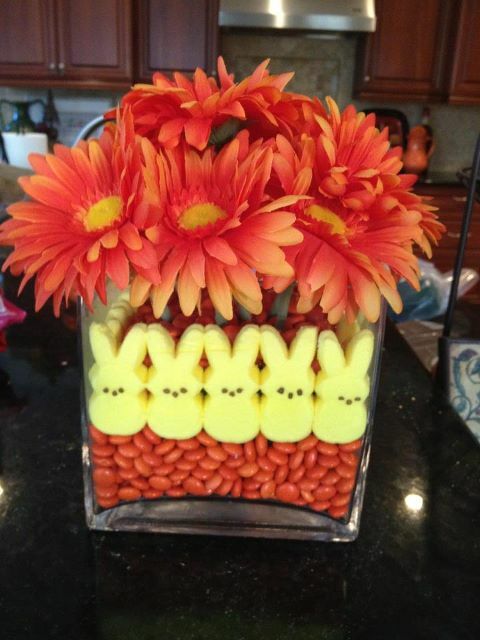 Chic on a Shoestring Decorating: Easter Peep Bouquet! My talented friend Julie made this super-duper cute Easter bouquet and I just had to share it! She was inspired pinspired by Pinterest! Now, need to get crackin' on my own Easter decor. It will be here before we know it!! PS: Remember to sign up for my current giveaway, $60 to Vinyl Crafts, sign up here!! I saw this and pinned it too! Love it! Oh how beautiful! Love the idea and the colors! So cute! In about three days the flowers would be falling out at my house because everyone thought they 'discretely' were the only one to take a handful of the Reese's. I saw this on pinterest the other day and have it on my list of things to do. Yours is gorgeous. Thanks for sharing. Great blog! Just followed and joined the link party! going to have fun looking through all of your archives! what size is the vase?